Hello guys, welcome to my blog. Today, we'll discuss another interesting Java interview questions, BufferedReader vs Scanner. It's not only important from interview point of view but also to work efficiently with Java. Even though both BufferedReader and Scanner can read a file or user input from the command prompt in Java, there some significant differences between them. One of the main difference between BufferedReader and Scanner class is that former class is meant to just read String or text data while Scanner class is meant to both read and parse text data into Java primitive types like int, short, float, double, and long. In other words, BufferedRedaer can only read String but Scanner can read both String and other data types like int, float, long, double, float etc. This functional difference drives several other differences in their usage, which we'll see in this article. 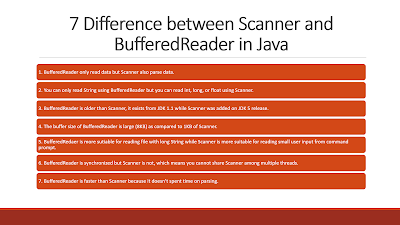 Another difference is Scanner is newer than BufferedReader, only introduced in Java 5, while BufferedReader is present in Java from JDK 1.1 version. This means, you have access to BufferedReader in almost all JDK versions mainly Java 1.4 but Scanner is only available after Java 5. This is also a popular core Java question from interviews. Since many developer lack Java IO skill, questions like this test their knowledge about API and how to do some practical task. You will not only learn about those key differences about BufferedReader and Scanner in this article but also about how to use them in a Java program. Btw, if you are new in the Java development world, I suggest you to first start with a comprehensive course is like The Complete Java Masterclass on Udemy. It's very affordable and you can get it under $10 sometimes. The course is really nice and updated for latest Java version, and I recommend to both beginners and intermediate developers who want to learn Java in depth. Anyway, let's get back to the topic. 1. A scanner is a much more powerful utility than BufferedReader. It can parse the user input and read an int, short, byte, float, long and double apart from String. On the other hand, BufferedReader can only read String in Java. 2. BuffredReader has a significantly large buffer (8KB) than Scanner (1KB), which means if you are reading long String from a file, you should use BufferedReader but for short input and input other than String, you can use Scanner class. 3. BufferedReader is older than Scanner. It's present in Java from JDK 1.1 onward but Scanner is only introduced in JDK 1.5 release. 4. Scanner uses regular expression to read and parse text input. It can accept custom delimiter and parse text into primitive data type e.g. int, long, short, float or double using nextInt(), nextLong(), nextShort(), nextFloat(), and nextDouble() methods, while BufferedReader can only read and store String using readLine() method. 5. Another major difference between BufferedReader and Scanner class is that BufferedReader is synchronized while Scanner is not. This means, you cannot share Scanner between multiple threads but you can share the BufferedReader object. This synchronization also makes BufferedReader little bit slower in single thread environment as compared to Scanner, but the speed difference is compensated by Scanner's use of regex, which eventually makes BufferedReader faster for reading String. You can further check Java Fundamentals: The Java Language course on Pluralsight to learn more about that in depth. The membership will give access to more than 5000+ good quality courses on all latest topics plus their new certification practice exams, interactive courses, and practice projects to help reinforce what you're learning. Since we programmers have to learn new things every day, an investment of $299 USD is not bad at all and they are currently offering a 33% discount as well. Though both BufferedReader and Scanner can be used to read a file, Scanner is usually used to read user input and BufferedReader is commonly used to read a file line by line in Java. One reason for this is Scanner's ability to read String, int, float or any other data type and BufferedReader's larger buffer size which can hold big lines from a file in memory. Though it's not a restriction and you can even read a file using Scanner in Java. Alternatively, you can even read a file in just one line of code in Java 8. 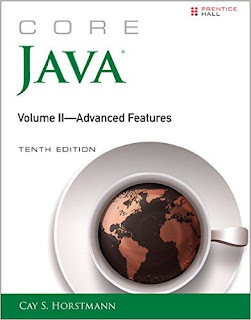 If you like books, you can also read Core Java Volume 2 - Advanced Features by Cay S. Horstmann to learn more about Java IO fundamentals. It's one of the key areas in core Java programming which separate an intermediate Java developer to an expert one. 1. Which is best SmartPhone in the market? You can see that Scanner is capable of reading both String and numeric data from command line. You can also see how easy it is to read a file line by line using BufferedReader. That's all about the difference between Scanner and BufferedReader class in Java. Even though both are capable of reading user input from the console, you should use Scanner if an input is not big and you also want to read different types of input e.g. int, float and String. Use BufferedReader is you want to read the text without parsing. Since it has a larger buffer, you can also use to read long String in Java. Thanks for reading this tutorial so far. If you like this tutorial then please share with your friends and colleagues. If you have any questions or feedback then please drop a note. If you want to keep in touch follow me on twitter, my id is javinpaul.